Former Alaska House Speaker Pete Kott is asking a judge for a prison sentence of no more than 33 months. Jim Wendt, Kott's attorney, had also asked U.S. District Judge John Sedwick November 9th to reconsider Kott's September 25th conviction on bribery, conspiracy, and extortion charges - but was denied. Federal prosecutors are asking judge Sedwick to impose a sentence against the convicted former Republican of at least 10 years and up to 12 and a half years in prison, according to a sentencing memorandum filed Friday. Wendt said Monday that Kott should not get the 12-year sentence recommended by federal prosecutors because he did not actually receive anything of monetary value from former oil company bagman Bill Allen. Allen has already pled guilty to bribing Kott. Kott's sentencing is at the U.S. Courthouse in Anchorage Friday December 7th. 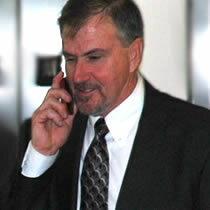 Allen calls Kott the day Allen is confronted by the FBI - Allen called numerous state and federal lawmakers to try to get them to confess to previous crimes. "Remember, what we talked about three, four, five weeks ago, we'd just add on X-amount, I forget what it was exactly, to your bill or something." The next day, the FBI raids began. © AlaskaReport. All Rights Reserved.